Next month, Cambridge University Press will publish Islamic Societies to the Nineteenth Century: A Global History by Ira M. Lapidus (University of California, Berkeley). The publisher’s description follows. Ira Lapidus’ global history of Islamic societies, first published in 1988, has become a classic in the field. For over two decades, it has enlightened students, scholars, and others with a thirst for knowledge about one of the world’s great civilizations. 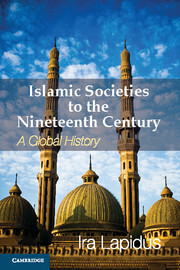 This book is based on parts one and two of Lapidus’ monumental A History of Islamic Societies, revised and updated, describes the transformations of Islamic societies from their beginning in the seventh century, through their diffusion across the globe, into the challenges of the nineteenth century. The story focuses on the organization of families and tribes, religious groups and states, depicts them in their varied and changing contexts, and shows how they were transformed by their interactions with other religious and political communities into a varied, global and interconnected family of societies. The book concludes with the European commercial and imperial interventions that initiated a new set of transformations in the Islamic world, and the onset of the modern era. Organized in narrative sections for the history of each major region, with innovative, analytic summary introductions and conclusions, this book is a unique endeavor. Its breadth, clarity, style, and thoughtful exposition will ensure its place in the classroom and beyond as a guide for the educated reader.